2 ½ Cups Gluten Free Oat Flour (Bob’s Red Mill) You can substitute coconut, or quinoa flour, but be aware, quinoa has a slightly bitter flavor and the coconut flavor will over power the peaches. In food processor chop peaches into chunks, add eggs, butter and lemon juice and blend again, just to beat the eggs. In separate bowl whisk together flour, xanthan gum, salt, baking soda, baking powder, sugar and sweetener. Pour flour mixture into food processor and pour hot water over flour. Gently pulse blender until flour is incorporated. Process only until all ingredients are blended. 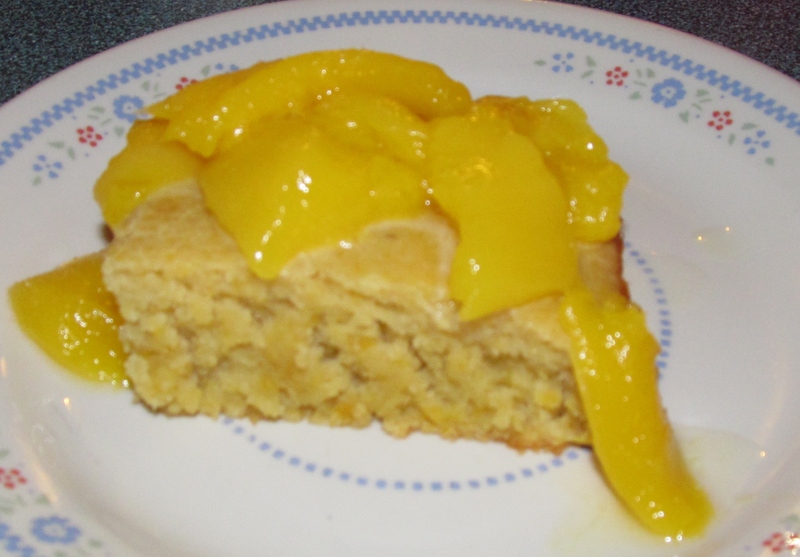 You can let this batter set for a while if you want, but with the peaches added it is moist and not very grainy if you go ahead and bake it. Pour batter into 9×13 inch, greased and GF floured baking pan. (for cakes I would rather use additive free powdered sugar, to flour cake pans). Bake 30- 35 minutes or until cake is done and browned around the edges. When ready to serve top with sliced mango. You must refrigerate any left over cake.